Throughout my travels, I've stumbled upon some amazing spice shops, most notably The Spice House in Chicago and The Savory Spice Shop in Boulder. This got me wondering....might we have a spice shop in DC? As I asked around, everyone told me that we didn't so I didn't look into it further. Then, one day, I saw a deal for half off spices and teas at The Spice & Tea Exchange in DC. Lo and behold, we have a spice shop! And, in fact, it has been in business in Georgetown for over a year! The Spice & Tea Exchange is situated on Wisconsin Avenue, just off M Street towards the water, in a little townhouse. As soon as we stepped in, we could smell the spices! We were immediately greeted by the owner, Keith Campbell-Rosen, who courteously showed us around. 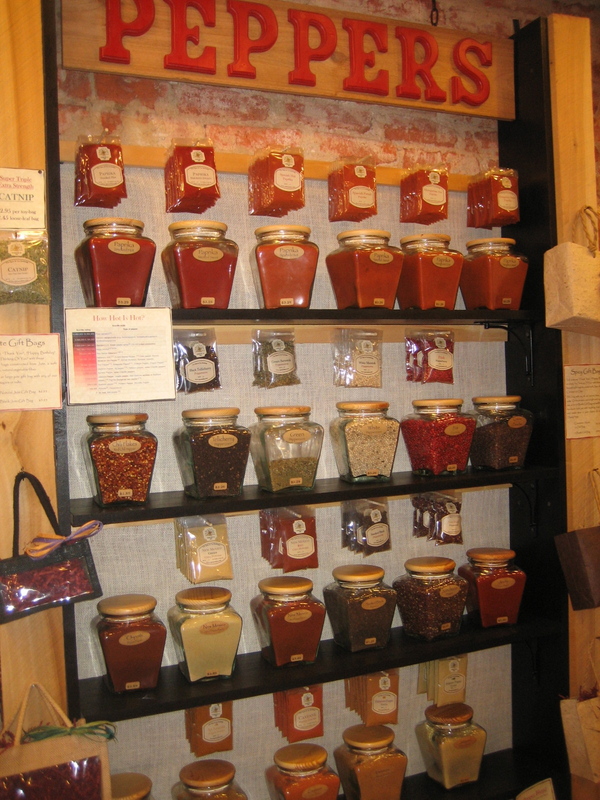 He has done a great job of organizing the spices throughout his store. Come to find out this is actually a franchise and this is their 17th store. Very cool. There were 5 sections to the shop. On the first wall to the left, I found your typical spices -- basil, cilantro, cumin, etc. along with some atypical spices such as burgundy wine powder, gumbo file powder, and maple syrup granules. To the right, was a special pepper section, which showcased 6 different types of paprika. I love hot, spicy food and am always in search of a different pepper. They had a few that are hard to find and one in particular that I hadn't heard of -- Datil. This pepper comes from Florida and is incredibly hot. I picked up a half ounce for $3.98. This pepper was the most expensive of all priced at $7.95 per ounce! Next, I went to the custom blends section. This is always my favorite section of any spice shop as it includes their unique blends. As I opened each jar to sniff the seasonings, I was blown away by a few incredibly unique spices. I decided to get three from this section -- a Tuscany blend to be used in olive oil as a dipping sauce, Jamaican Jerk seasoning, and a Thai Red Curry spice. I can't wait to cook with these. The entire time I perused the spices, Zach was checking out the teas. They have a great selection of loose leaf and blooming flower teas. They also had some unique rices including one that was a Thai green rice. Lastly, we took a look at the salt section. From black truffle salt to Fleur de Sel sea salt, this was quite the selection. They had ghost pepper sea salt, which is known for being the hottest pepper in the world. They also had jalapeno sea salt, lime coconut smoked sea salt, and pinot noir sea salt. Additionally, they had a great selection of peppers and flavored sugars. There certainly was a lot packed into this little shop. I'd say I only have two criticisms of this place. First, they are incredibly pricey as compared to the other spice shops I've been to. Their custom blends are $4.89 per ounce, which is much more expensive than the shops in Chicago and Boulder. Secondly, they don't let you openly taste the spices. In the other shops I've been in, you could put some on your hand, taste it, then throw it on the ground. That isn't the practice here, though the owner does allow you to try some if you'd like. So, other than those two things, I really like this place. I'm looking forward to cooking with my new spices and coming back to get more!